When Orville Wright first took the Flyer into the air on the morning of 17 December 1903, his short flight represented the culmination of a rigorous four year step-by-step test and development process undertaken with his brother, Wilbur. The brothers Orville and Wilbur Wright were small-town businessmen, running the local newspaper and also a successful bicycle manufacturing business in Dayton, Ohio. Having caught the huge bicycling boom of the 1890s, the brothers took a keen interest in all-things mechanical and were also keen followers of developments in automobiles and aeronautics. At this time the leading aviation pioneers were Otto Lilienthal in Germany and Octave Chanute in the USA. When the American publication ‘McClure’s Magazine’ published an illustrated account of Lilienthals achievements in its September 1894 issue, the interest of Wilbur Wright was aroused. He began to follow developments in aeronautics with increasing interest. However, on 9 August 1896 Lilienthal fell to his death when the glider he was flying stalled and abruptly sideslipped into the ground. Spurred into action by published accounts of the death, Wilbur and Orville began to read everything they could find on the subject of flight. They also began a letter correspondence with many of the pioneers of the time, in order to exchange more information. As a result of the their initial research the Wrights realised that Lilienthal’s accident had resulted from inadequate control of his glider. Lilienthal had steered by shifting his body-mass, as with modern hang-gliders, and they realised that body-shifting couldn’t provide enough leverage to keep an aircraft under control at all times. At the time, it was popularly supposed that once an aircraft was in the air, it would have natural stability like a ship in water, making flat skidding turns while remaining wings level – whereas the bicycle-riding Wrights expected an aircraft to require numerous small control corrections to keep it straight and level. Like a bicycle, they foresaw that it would be necessary to bank into a turn. The solution to the control problem that Wilbur Wright came up with was wing warping. This involved twisting the wing so that it’s angle of incidence on one side was larger than on the other, thus generating unequal lift and hence rolling the aircraft. In the summer of 1899 the Wrights built a biplane kite to test the concept. The truss-braced biplane layout was borrowed from Octave Chanute’s innovative 1896 glider, maximising wing area for minimum weight. The kite flew successfully and in the following year the brothers set about building a man-carrying kite-glider using the same configuration. After consultation with the US Weather Bureau, a site near Kitty Hawk in North Carolina was selected as having the steadiest and most reliable winds. Flights testing of the 1900 glider began at Kitty Hawk in October, and proved highly encouraging. The glider featured a forward (canard) horizonal control surface, as the brothers wished to avoid a Lilienthal-style fatal plunge into the ground. Although lacking any vertical control surfaces the glider exhibited excellent pitch control and managed glides of up to 400 feet (123 m). Having completed the tests the glider was abandoned on the sand dunes. 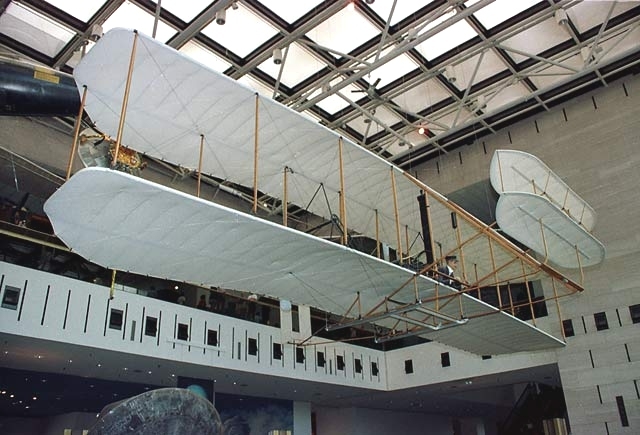 In 1901 the Wrights returned to Kitty Hawk with a new glider featuring a redesigned wing. With revised camber, increased wingspan and a wing area almost double that of the 1900 glider’s the new machine was expected to fly much further than it’s predecessors. In fact its performance was much worse. After this unexpected setback the Wrights went back to basics. After designing and building a wind tunnel to test numerous wing configurations they found that the theoretical lift data published so far by other researchers was actually incorrect. 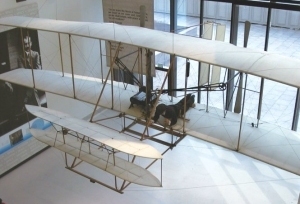 Using their new found empirical knowledge, the Wrights built a new machine, the 1902 glider. The glider featured as wing with an aspect ratio almost twice that of their previous machines. Test flying commenced on 19 September 1902 and quickly proved the increased performance of the new machine. Glides of more than 500 ft (152 m) were achievable. However, the machine had a notable tendency to enter a gentle spiral dive when making turns and to counter this the fixed vertical fin was modified into a movable rudder connected to the wing warping mechanism. Controllability was much improved and the brothers made hundreds of flights, some reaching 622 ft (190 m). After completing fight testing, the Wrights filed a patent to protect their design rights. Thoughts now turned to a powered version of the glider, but first they needed a a powerful lightweight engine. Automobile engines of the time were much too heavy, and having found that no lightweight engines where available commercially, they set about designing one. The design featured a four-cylinder water-cooled petrol engine, and was hand-made by Charles Taylor, a skilled mechanic and employee of the Wright Brothers. Machining of parts began in December 1902 and testing of the engine commenced in February 1903. At the same time the Wrights worked on developing a practical propeller. After many tests and modifications they evolved a blade shape which proved to be much more efficient than any contemporary design. 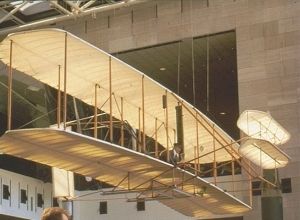 The 1903 Wright Flyer was a scaled up version of the 1902 glider. Structurally it consisted of a rigid truss-braced rectangular box section which made up the wing centre section. Attached at each end were the outer wing sections, which were rigidly jointed only at the leading edge (which functioned as the forward spar) to permit wing warping. The ribs were held in position by pockets in the wing covering material and only losely connected to the rear spar. A biplane canard horizontal stabiliser was mounted on rigid booms projecting forward from the wing, while a movable biplane rudder was mounted vertically behind the wing. Support frames between the forward stabiliser and the wing acted as landing skids. The engine as mounted on the wing centre section to the right of the centreline, and drove two contra-rotating propellers via a chain drive. The pilot lay prone on the wing on the opposite side of the centreline to the engine. Although not fully appreciated at the time, the extreme aft position of the centre of gravity of the Flyer gave very little natural stability and made it very tricky to fly. The Flyer was built during the summer of 1903 and departed by rail for Kitty Hawk in late September. Ground runs of the assembled Flyer proved that the hollow propeller shafts initially fitted were too weak. New stronger shafts were installed on 12 December. 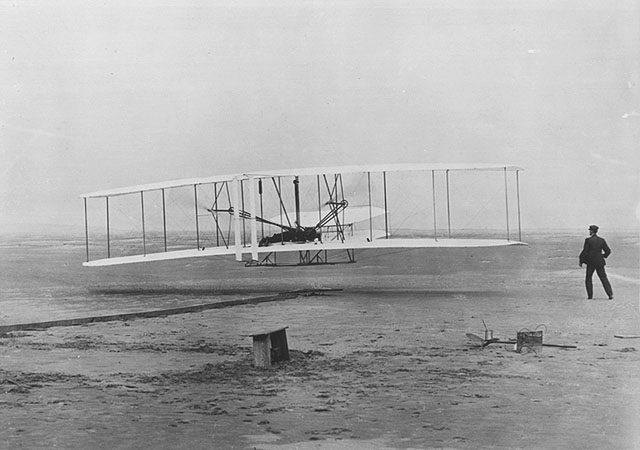 On 14 December Wilbur Wright took the Flyer for a short hop of about 60 ft (18.3 m). The flight ended with a heavy landing and the next two days were taken up with repairs to the landing skids. On the morning of 17 December 1903 the Wrights were ready for another attempt at powered flight. The Flyer was designed to take-off from a little trolley which ran along a 60 ft (18.3 m) long monorail assembled in sections, and a suitable stretch of level ground was selected for the launch site, facing into a steady 21 mph (34 km/h) wind. 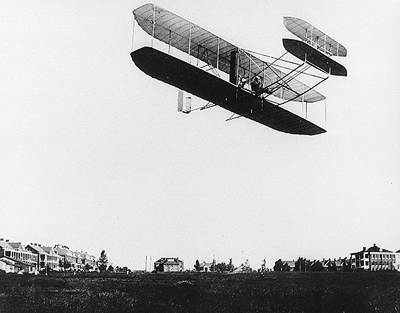 With Wilbur having flown on the 14th, it was Orville’s turn to attempt a flight. His first flight lasted 12 seconds and reached about 100 feet (30 m). Three more flights followed, with the brothers taking it in turns. The last flight reached 852 ft (260 m) in 59 seconds. The flights were witnessed by members of the Kill Devil Hill Life Saving Station, one of whom took the famous action photograph that ushered in the new age of aviation. The Flyer had been badly damaged by a gust of wind after the fourth flight of the day, but the brothers had the wreck transported back to Dayton for storage. In 1904 the they built a new aircraft (Flyer II) which retained the same layout but differed in many details from the 1903 prototype. Flight tests from Huffman Prairie, east of Dayton, showed the new version exhibited the same pitch instability as its predecessor. However the brothers were becoming to adept at controlling the machine and they made 80 short flight, including two which exceeded 5 minutes duration. Ballast was added to the canard, which moved the centre of gravity forward and improved controllability. On 20 September they made the first circling flight by an aircraft in history. Further experimentation showed that reducing the anhedral (downward) angle of the wings significantly improved stability. 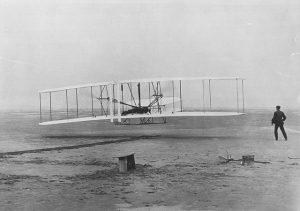 In 1905 the Wrights built a new Flyer (Flyer III), using the engine and propeller from the 1904 machine. Now regarded as the first ‘practical’ aircraft, it featured zero anhedral wings, upright seating for the pilot and a passenger, and an improved control system in which the rudder was disconnected from the wing warping system so that it could be controlled independently. On 5 October 1905 Wilbur flew 24 miles (38.6 km) in 38 mins and 4 secs, circling the field at least 30 times in front of witnesses. 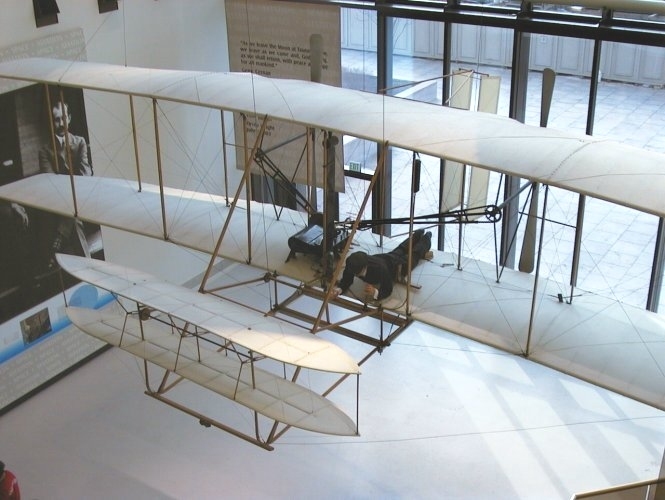 After the successful flights of 1905 the brothers did not fly again until 1908, as they set about patenting their inventions. Between 1907 and 1910 the Wrights made seven examples of the Model A – a production aeroplane. Four more were licence-built in France. In August 1908 Wilbur demonstrated a US-built Model A to French audiences at a racecourse near Le Mans. French pioneers who watched the flights were astounded at the controllability and manoeuvrability which the machine clearly exhibited. Between August and December Wilbur made more than 100 flights, including six of more than 1 hours duration. He won numerous endurance and altitude records and prizes. The flight demonstrations set a new benchmark for the Europeans, who were galvanized into improving their designs until they could emulate and then exceed the standards they had witnessed – progress thereafter quickly gathered pace throughout Europe. Meanwhile in the USA, Orville demonstrated a Model A to the US Army at Fort Myer. From 3 September he made 10 flights, but on 17 September he crashed after the starboard propeller blade broke. His passenger, Lt Thomas Selfridge was fatally injured and Orville suffered a broken hip. Military trials were postponed until the following year, when a replacement aircraft would be available. 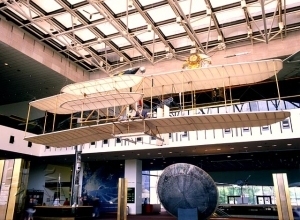 The 1909 Signal Corps Flyer successfully completed the Army’s acceptance trials and in July became the world’s first military aeroplane accepted into military service. Despite these undoubted successes, by the start of 1910 competitors at home, such as Glenn Curtiss, and in Europe were pressing ahead with advanced new designs which threatened to progressively render the Wrights designs obsolete. Minor redesigns such as the Wright Model B and Model C failed to capture significant interest and the Wright Company thereafter lost it’s way. Wilbur Wright died of typhoid on 30 May 1912 and in October 1915 Orville sold his interest in the Wright Company and took up a career largely outside of aviation. While many claims have been put forward as to who made the first powered flight, none – except for the Wright Brothers – has met the three clear criteria by which such an accomplishment must be judged: the flight must be ‘Powered, Sustained and Controlled’. Furthermore, the Wrights succeeded in their attempt through a thorough understanding of the problems involved, combined with well-judged technical solutions and, (as is now increasingly appreciated by the pilots of replica Flyers), a not inconsiderable skill in piloting. Wright Model A Production version designed as a two seater for pilot training and demonstration flights. Engine(s): One water-cooled, 4 cylinder horizontal inline Wright of 12 hp (8.9 kW). Engine(s): One water-cooled, 4 cylinder horizontal inline Wright of 15 hp (11.2 kW). Engine(s): One water-cooled, 4 cylinder horzontal inline Wright of 20 hp (14.9 kW). Engine(s): One water-cooled, 4 cylinder vertical inline Wright of 28 hp (20.9 kW). Design Office: Dayton, Ohio, USA. Engines were built by Bariquand & Marre of Paris and Léon Bollée of Le Mans. The source of the engines for the German aircraft is not known. ** = modified design. (Short-built examples used French engines). Total Produced: 39+ a/c (Variants I to Model A) + 3 gliders. * In-depth photographic portrait of the Wright brothers and their aircraft. * Well illustrated account of the Wright brothers. * Describes the evolution of the Wright Flyer in detail. * Highly respected biography of the two brothers. 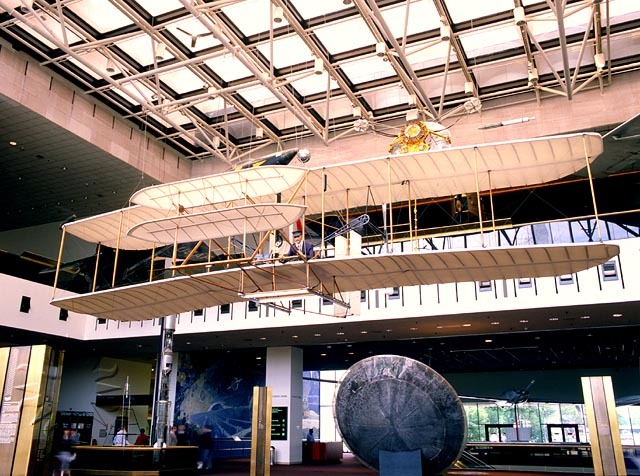 * Excellent introduction to the Wright Brothers activities. * Excellent general history of the early years of flight.